70.3 Punta del Este triathlon begins with a 1.2-mile (1.9 km) swim in the calm blue waters of the Maldonado Bay, where swimmers will pass the tranquil Gorriti Island, before returning to the beach where they started. Athletes will then embark on a two-loop, 56-mile (90 km) bike course that travels along the stunning coastline towards Punta Ballena Hill. Finally, athletes will take on a two-loop, flat and fast 13.1-mile (21 km) run course that winds around the peninsula of Punta del Este to the point where the Atlantic meets the Rio de la Plata. 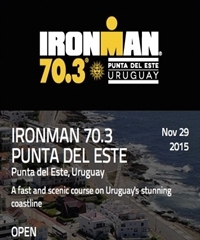 The course offers striking ocean views as it passes by the city’s famous fish markets, prestigious yacht port, multiple restaurants and “Los Dedos” – an iconic sculpture of a giant hand emerging from the sand, one of Uruguay’s most recognizable landmarks – before a lively finish line just off the beach near The Conrad Hotel.